Human Body Anatomy is one the key areas of study in medical science. Understanding human anatomy is essential not only for medical professionals but also for general public. 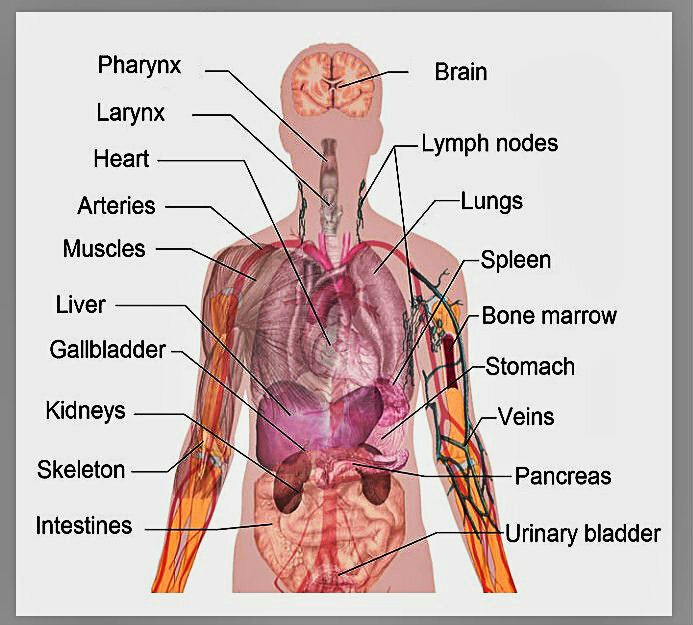 The diagram below shows various key organs and parts of the human body and is a great learning resource for kids and adults alike. Human anatomy can be studied on a macro and a micro level. The macro view is called gross anatomy while micro is referred to as histology. In gross anatomy, the human body is studied through systematic and regional methods. Systematic looks at the human body through the lenses of different systems (e.g. circulatory, nervous, etc) while regional studies individual regions (or parts) of the body. Systematic is a more scientific approach as one gets to learn how various organs in the system interact with one another. The anatomy diagram that you see below simply lists various organs such as brain, heart, kidneys, liver, intestines and is more in line with the regional approach. This entry was posted in Science, Top and tagged body of a human, human anatomy, human anatomy diagram, human body, human body anatomy, human body chart, human body diagram by admin. Bookmark the permalink.